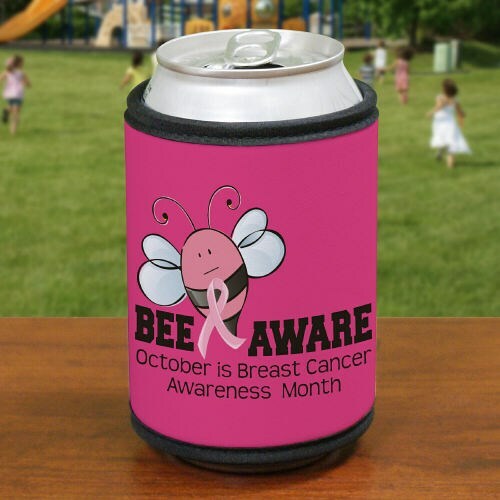 Show your support and increase awareness with our Bee Aware Breast Cancer Can Wrap Koozie. Our Awareness Koozie’s are great for encouraging health and wellness along with educating and showing support for those fighting for a cure. These Breast Cancer Gifts is non-personalized and measures 4" x 9 1/2" with velcro closure around your beverage bottle or can. October is National Breast Cancer Awareness Month. MyWalkGear.com reminds people to educate and support awareness for those affected by this disease. For every Breast Cancer Awareness Item purchased, MyWalkGear.com will donate a portion of the sales to help find the cure.